Ben has twenty years acting experience on stage, on screen and behind a microphone. A veteran voice actor and narrator, Ben is best known as co-star of the award-winning time travel comedy Night Terrace, now in its second season. He plays Eddie Jones, the hapless sidekick to Dr Anastasia Black, played by Neighbours’ Jackie Woodburne. He has narrated more than fifty educational and training programmes, mostly for ClickView (with whom he also works as a presenter and writer). 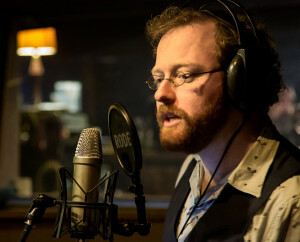 He’s also worked on many game and app projects in character roles, including Christy Dena’s award-winning AUTHENTIC IN ALL CAPS, the Great Ocean Walk audio stories app for iTours Australia, and interactive location-based narratives with Story City. Ben is an experienced reader and can deliver a quality performance first time. He works with David Ashton of Sample and Hold Studios to deliver high-quality audio. You can listen to some samples of Ben’s work below. Ben often appears as characters in games for Pop Up Playground, including 2016’s The Cloud for VicHealth and Being Claire Hooper for the Melbourne Comedy Festival. On screen, Ben has appeared in various short films including the Pi spoof M: Faith In Chocolate, comedy Star Wars fan film Suburban Knights Episode Two, The Mortician’s Story and Martha Arthur. His television appearances include being appalled in The Bazura Project and affable in Woodley, both for the ABC. Ben’s theatrical credits include Arcadia (Eclipse Theatre), Turnstiler (La Mama), Twelfth Night (Blue Chair Theatreworks) and musicals The Taking of Ramsey Street, The Lobotomist (both with theatre in decay) and The Terminativity (Bella Union). He co-starred in his own short play, A Record or an OBE, for three seasons in Melbourne and Adelaide, and performed sketch comedy with Melbourne-based troupe The Anarchists Guild Social Committee.